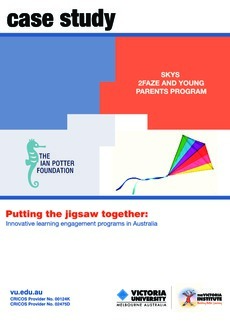 This case study is based on research conducted in 2013 by A/Prof Kitty te Riele, Dr Dorothy Bottrell and Dr Vicky Plows from The Victoria Institute at Victoria University, for the project Putting the jigsaw together: innovative learning engagement programs in Australia. The project was majority-funded by the Ian Potter Foundation and also supported by Dusseldorp Skills Forum and by The Victoria Institute through the Australian Government’s Collaborative Research Network. The research project explored options for marginalised young people to complete secondary schooling (Year 9-12 or equivalent) through innovative, flexible and/or alternative learning programs.